This rather nice little order was to replace a very aged wicket gate where the posts, as well as the gate itself, had rotted away, leaving virtually just the skin of paint (photo 2). Although made from some unidentifiable hardwood, the weather had taken its toll and a total replacement was the only answer, though this one had obviously been in place for many years. I always enjoy making gates because they are actually just a simple frame with no complicated joints, yet the finished job is big and looks impressive. In this case, the dimensions were determined by the width of the existing concrete path and the brief was for something 'chunky and country style' rather than twee. I felt that the existing design fitted the bill perfectly so more or less copied it directly - there is no point reinventing the wheel! However, I did settle on oak as the raw material, primarily for its durability as the replacement wasn't going to be painted. I have had some thick air-dried material lying around for several months; mainly because it was too damp for the work I originally bought it for. As this is an outside job which is supposed to have 'character', this partially-dry stock is ideal, but be aware that it will possibly crack and twist to some degree as it dries out further. Provided you warn clients about this in advance it is rarely a problem, but if unexpected cracks appear later then explanations are more difficult. 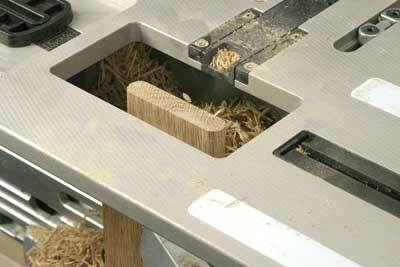 Select the timber carefully as oak heartwood is very durable, but the sapwood isn't and soon rots off. Some of my pieces were quite sappy so these were cut down to smaller dimensions to eliminate anything that looked at all dodgy (photo 3). 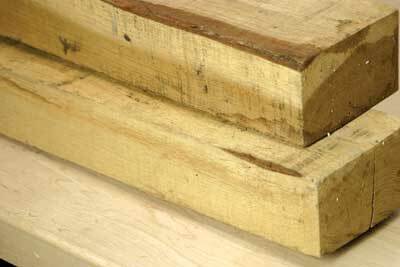 As well as rotting, the sapwood is often a target for woodworm so it is best all removed. 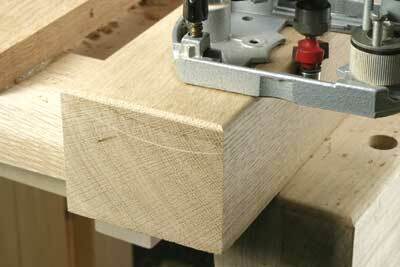 Use a bandsaw to machine out all the pieces and then plane and thickness them to accurate dimensions. This thicknessing part is so important, as it is impossible to make neat and accurate joints unless all the components are exactly the same size (photo 4). 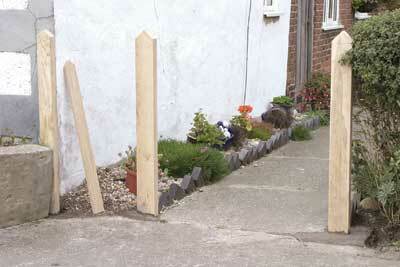 If you don't have a thicknesser, the timber yard will often do it for you at a nominal cost. 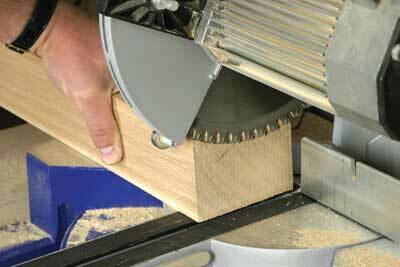 Cutting big sections of hard timber to length is also often a problem, particularly when you want really neat cuts. 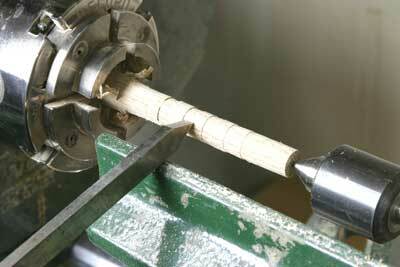 Very few of the chopsaws will cut through thick stock either, but they will trim it once it is virtually to length. It is all to do with the clearance under the motor as the saw pivots down. So I rough-cut to length by hand and then trim on the chopsaw with the timber all to the left-hand side of the blade and consequently well clear of the motor (photo 5). 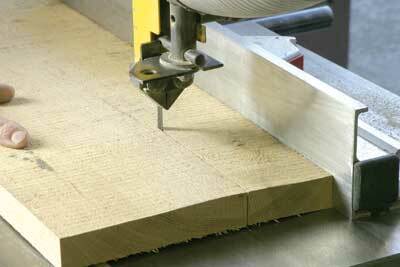 For the slats there are two options; either cut strips off the side of 75mm (3in) material or cut them from thinner stock. Although the former option is probably less wasteful, I have always found that strips cut from thinner boards are subsequently more stable as the timber is more evenly dry. I found some boards that would allow 75mm strips to be cut with minimum waste and ripped them down on the bandsaw (photo 6). 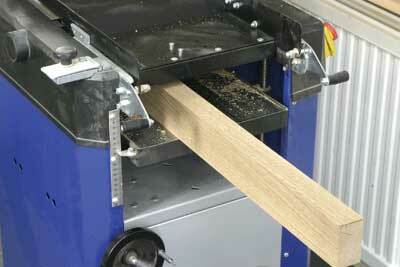 After planing and thicknessing the traditional picket tops are cut on the mitre saw. Once you have cut the first one, a small pencil mark on the back fence is all you need to align each cut without any further marking out (photo 7). 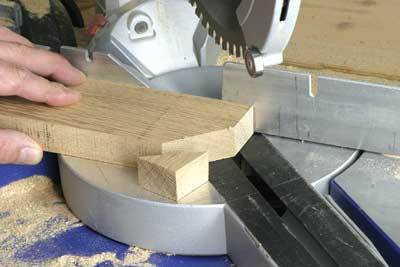 A few shortcuts like this really speed up the making process. I softened the edges of all the slats with a tiny rounding-over cutter in the router, running it all round one face only (photo 8). Leave the back sides perfectly square or you will start forming moisture traps. 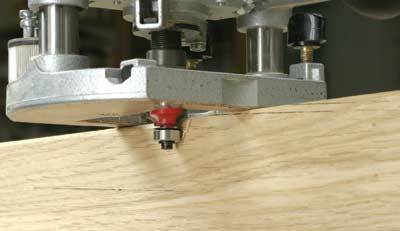 The main frame components are jointed with mortise and tenons in the traditional way, but developments in modern glues have changed the requirements slightly. These new adhesives are so strong that the joints don't need to be anywhere near as big as they would have been in the past; you no longer need a massive gluing surface. I particularly like the foaming polyurethane glues that will stick to anything, are totally waterproof and also have good gap-filling characteristics - not that I would need that, of course! They are catalysed by moisture as well, so they work particularly well in air-dried timber with its higher moisture content. However, they do expand considerably as they dry and can actually push joints apart, so clamp everything thoroughly until it is set. 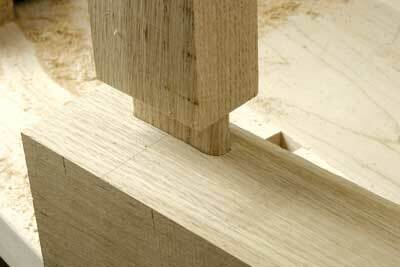 Without the need for really big joints I cut mine using the Leigh FMT jig cutting a 63 x 13mm (2 1/2 x 1/2in) tenon first (photo 9) and then the mortise to match (photo 10). Remember that, with this design where the stiles are different sizes, the gate is effectively 'handed' so orientate the joints correctly. Before you assemble the frame cut the matching angled tops on the stiles, again I rough cut them by hand and then trimmed to a neat finish on the chopsaw. 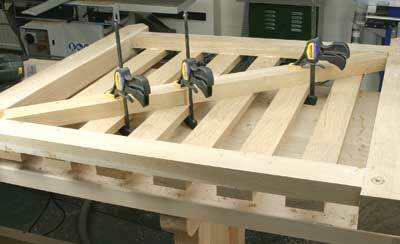 The four components of the frame can then be glued up and held with a couple of stout sash bar cramps, but do check it for squareness (photo 11). Fortunately, the FMT jig cuts very square shoulders so the frame tends to go together more or less square anyway but don't underestimate the distorting power of sash cramps. On exposure to moist air, the glue starts to foam and expand, but it is probably best left alone until it has set to a crisp-like state when it will just chisel away without leaving that disfiguring stain you get with PVA (photo 12). 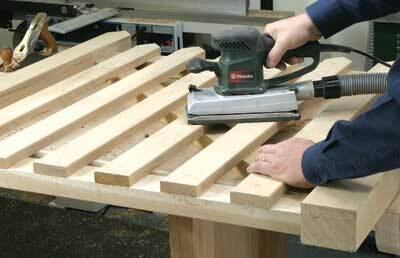 Drying time is normally about four hours, but it does depend on the moisture content of the wood as well. To further strengthen the joint, I turned some 13mm (1/2in) oak dowels on the lathe (photo 13) and then drove them into a hole drilled right through the joint. 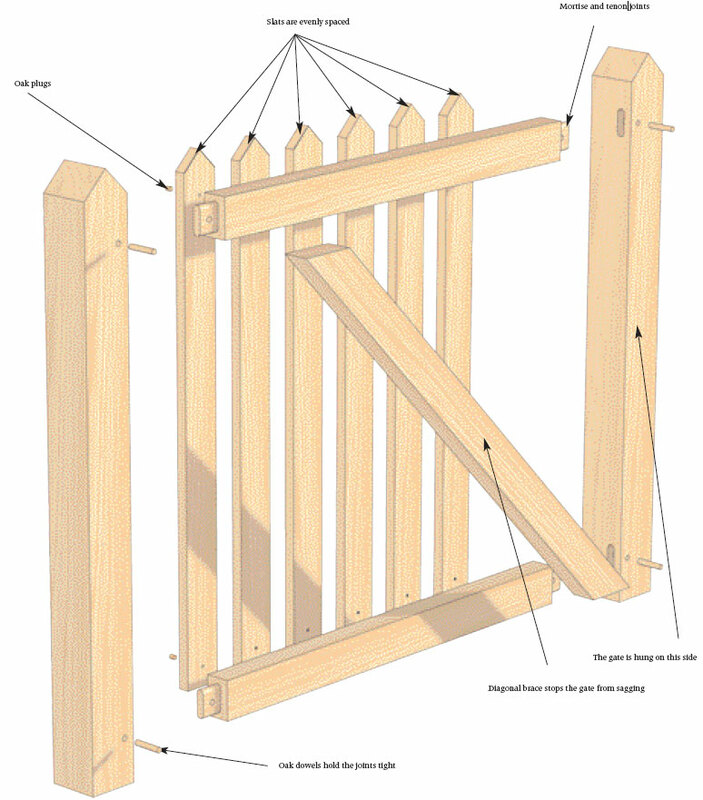 This adds tremendous strength if the wood should start shrinking away at the shoulders and helps to prevent the gate from sagging (photo 14). 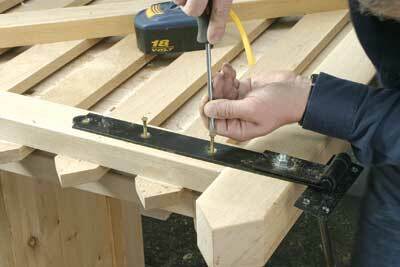 The slats are then spaced out across the frame and glued and screwed into place. 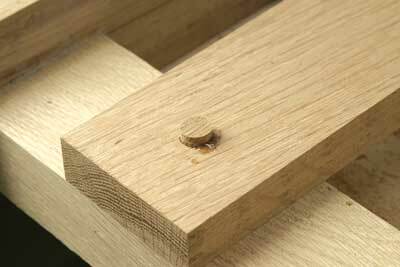 Do remember that steel screws will soon corrode in oak, so use brass ones but drill accurately to avoid shearing them off (photo 15). If you have difficulty driving brass screws, try fitting a steel one first and then replace it with a brass equivalent. I counterbored the screw holes and then cut some oak plugs with a plug cutter, freeing them off by cutting a slice through the block on the bandsaw (photo 16). Glue them in place, but be careful that the expanding glue doesn't push them out again (photo 17) - a smart whack with a hammer usually seats them firmly enough. 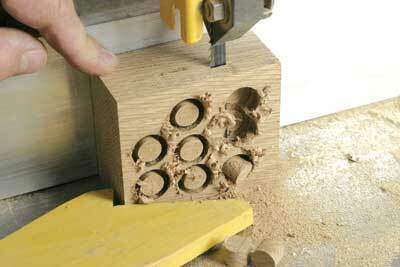 Once dry, chisel off the excess, sand the surface and you will hardly know there is a screw there. 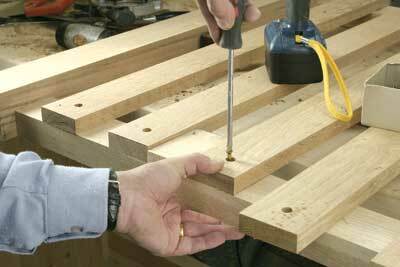 Now run the router round all the outer edges of the frame to give that more professional look (photo 18). This is a really quick job that takes only seconds but improves the appearance dramatically. 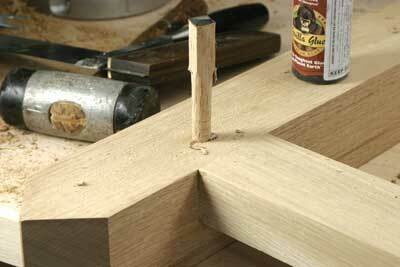 It also removes sharp edges that can feather off as the timber dries and cracks. 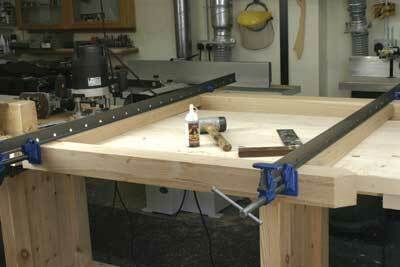 The diagonal brace is cut and fitted next; I just glued it in place, clamping it through the slats. 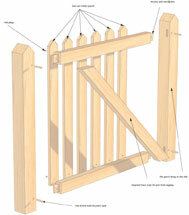 This brace is essential as it will prevent the gate dropping out of square over time (photo 19). That's all there is to this very simple construction, just give it a really good sanding to flush down the dowels and plugs and clean up any glue marks (photo 20). My clients intended to leave it totally untreated and let the natural silver colour develop as it weathers. However, I prefer to apply a couple of coats of Danish oil in the workshop to help slow down the drying out process and minimise any splitting. 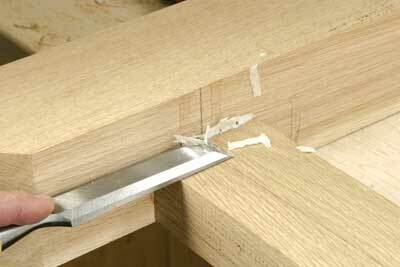 If the oil is not reapplied the timber will still weather silver, it just takes longer and with less damage. The strap hinges can be fitted in the workshop, using a coach bolt for the main fixing and brass screws for the others (photo 21). Use either galvanised hinges, or make sure they are painted black to minimise the corrosion where they are in contact with the oak. I replaced the hanging posts with a couple of new ones to match, concreting them in place a couple of days before hanging the gate (photo 22). Allow plenty of length to go into the ground to make sure they are really firm; there is a lot of leverage on a big, heavy gate like this. 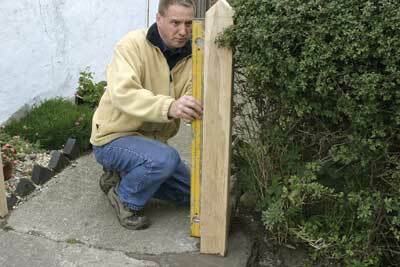 Use a line to get them properly orientated and a decent-sized level to check for plumb or you will find it impossible to hang the gate properly (photo 23). 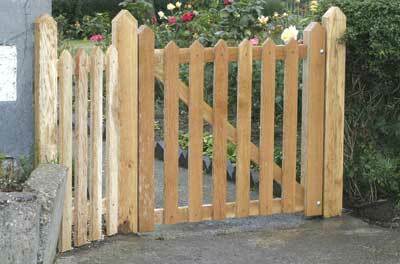 Allow for a 13mm (1/2in) gap between either end of the gate and the posts.Once the concrete is hard, you can hang the gate in situ. Wedge it in place first, but if the surrounding area is uneven, look for any high spots in the ground which might catch it as it opens (photo 24). 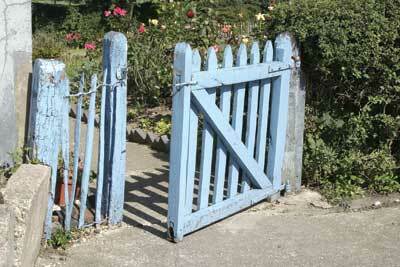 If you have any doubts, hang it quite high as there is nothing worse than a gate that drags. Screw the hinge pins in place, allowing for any play when the wedges are taken away. Fix the top hinge pin first and then adjust the bottom one until the gate sits level and opens easily without the hinge binding. 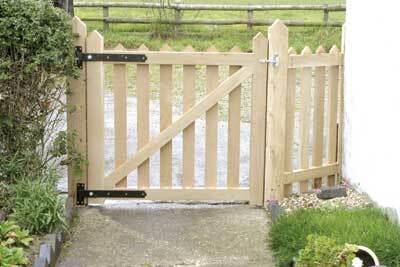 Finally fit a traditional gate catch and the job is finished. Hopefully it will last at least as long as the other one! 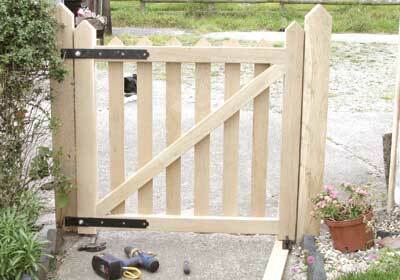 "I always enjoy making gates because they are actually just a simple frame with no complicated joints"